NEW! The fastest way to improve yield and purity simultaneously is with MCSGP where impure, product-containing side fractions are automatically recycled in a periodic closed loop process (see animation here). This continuously operating process maximizes yield while maintaining or improving product purity generating a significant improvement in process economics. MCSGP gives higher yield and purity than batch chromatography. Under license by ChromaCon AG, YMC is now providing MCSGP at pilot and production scale. Brochure focusing on Peptides and Oligo purification: click here. In batch chromatography, impure side fractions often have to be discarded to reach a certain product purity. With MCSGP, impure product-containing side fractions are internally recycled in a periodic closed loop process (see animation at link below) while pure product is continuously extracted. Thereby, little product is lost and the yield of pure product is maximized without any accumulation of impurities and retaining target purity. For small molecule production (e.g. oligo’s, peptides) solvent consumption is typically reduced by 70%, and solvent savings are even more accentuated under conditions of feed material overloading. With higher yield, the demand to synthesize more product to attain adequate final product kgs is lowered reducing operating costs associated with producing more batches. 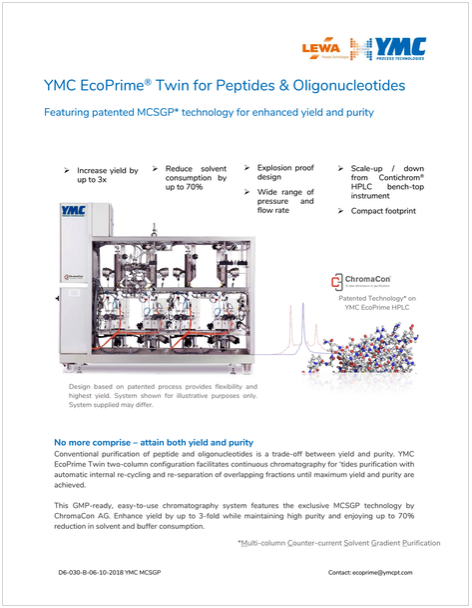 The MCSGP technology is patented by ChromaCon and licensed by YMC Process Technologies assuring you of the most advanced design for GMP production environments. This is a continuous process that delivers up to 80% more yield at target purity and operates with up to 10-fold higher productivity than batch. 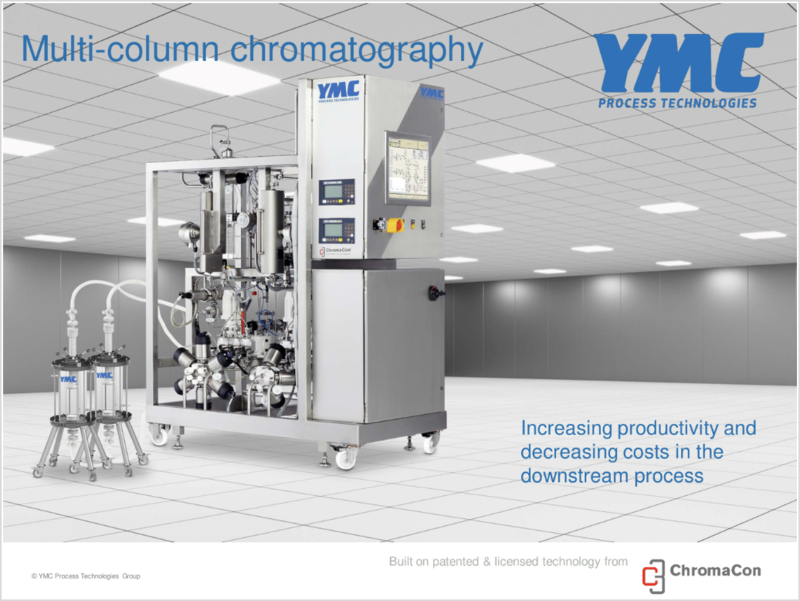 With a deep understanding of fluid dynamics—and the end-to-end requirements of chromatography processes—YMC can provide customized solutions to help you. Experts in solvent environments we supply systems meeting the most rigorous standards for ATEX / NEC control. All our systems are designed and manufactured in accordance with ASME / BPE guidelines. Full FAT and Turn Over Packages are available on our all our skids. Our experience in designing and building state-of-the-art EcoPrime HPLC chromatography solutions, using proprietary fluid dynamics has earned us a reputation for innovation among global leaders in pharmaceuticals and we leverage YMC’s long history of molecular separations and purification technologies and combine our fluid engineering and intellectual property in the advanced solutions we customize to the needs of our HPLC customers. See what else YMC Process Technologies can do - capabilities video here.